In this tutorial we are going to demonstrate how to add a webhook to the tool-execution endpoint. This is the web-page that appears after you have executed a tool. As a more useful example we are going to ask phdcomics for a random comic that we can display to entertain our users. At first let’s create a config file that defines the name and the type of your webhook. The name is phdcomics and with the type we define the entry-points at which we modify the Galaxy user-interface. In our case we want to display an image at the tool and workflow entry-point. The key activate gives you control per-webhook to activate or deactivate it. The next step is to define HTML/JS part which will control the part of the Galaxy UI. We create a new PHDComicsAppView view extended from Backbone. Inside this view we define a simple div-container with a button and a placeholder for our image called phdcomics-img. You can add additional functionality to your view, for example getting a new image on button click. The essential functionality however is stored getRandomComic. The big problem with phdcomics is that there is no nice API to retrive the comics, so we need to fallback to parse the HTML pages. We decided to do this in Python to demonstrate webhooks abilitity to call self-defined python functions. 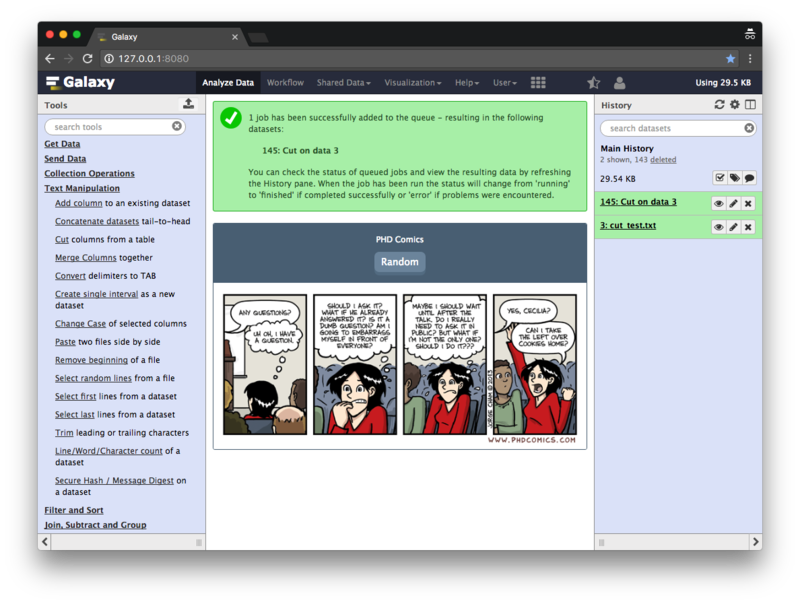 Please note the url = galaxyRoot + 'api/webhooks/phdcomics/get_data';, which calls an REST endpoint defined by use in the next step. The return value of this endpoint is retrived in JS and can be displayed or modified. The following hands-on will define an API endpoint that is called from the JS code of your webhook. Make sure you name the python function main and that all third-party requirements are installed in your Galaxy virtual environment. Please note that the main() can consume params from your client but also the Galaxy trans object, which will give you access to the entire user-object, including histories and datasets. To make your webhook appealing you can also add custom CSS which you can use in your HTML/JS code. Please make sure you have activated webhooks in your config/galaxy.yml file by setting the webhooks_dir to the path in which your phdcomics folder is located. Submit one tool and see if your webhook is working on the tool-submit page. First of all, thank you for completing this tutorial. We have learned how to add webhooks to your Galaxy. With a minimal amount of code you can extend Galaxy's user-interace. This material is the result of a collaborative work. Thanks to the Galaxy Training Network and all the contributors ( Clemens Blank, Martin Čech, Björn Grüning)!